Vic Law surveys his options. The senior forward hit a buzzer-beater to end the first half. 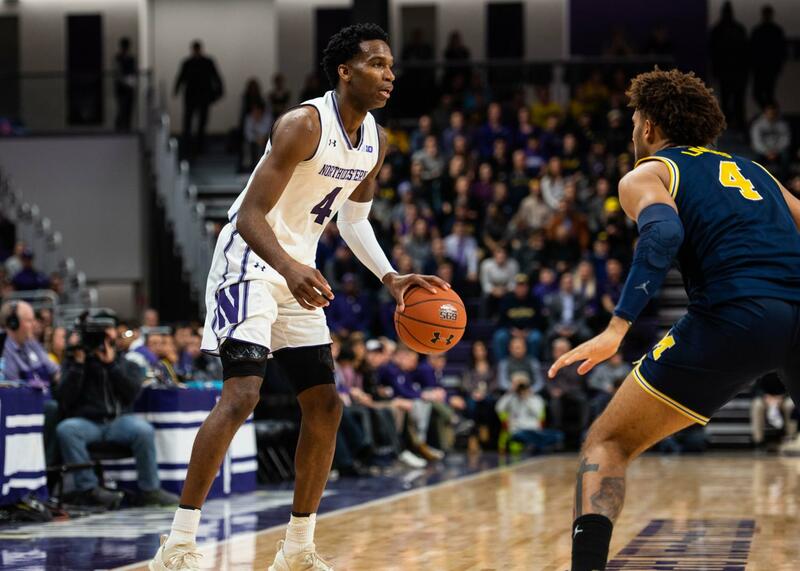 In its second Big Ten matchup of the season, Northwestern had a tough opponent— No. 5 Michigan. After a slow start, the Wildcats (6-3, 0-2 Big Ten) came back from being down by as much as 15 to the Wolverines (9-0, 2-0 Big Ten) early in the second half, but lost a heartbreaker 62-60. Michigan’s highly-touted guard Jordan Poole was as good as advertised early. The sophomore guard scored 11 points in the first half, including nine of the Wolverines’ first 15 points. Michigan got out to an early 22-12 lead, but NU would respond. Ryan Taylor, Vic Law and Dererk Pardon each scored on a 7-0 run that cut the Michigan lead to three. Pardon kept the Cats afloat while the rest of the team struggled to score. The senior center from Cleveland scored 16 points in the first half on 7-8 shooting. It was a different story for the rest of the team, who shot a mediocre 28% from the field. Despite the poor shooting performance, NU went into the half down by six. The Wildcats’ offensive struggles continued into the second half as Michigan extended its lead to 15 with 17:19 remaining. But once again, NU responded to a Wolverine run with one of its own. With lockdown defense and a balanced offensive attack, the Cats trimmed the lead to just two. Michigan extended their lead to five before two Vic Law threes gave NU its first lead of the game, 52-51. The two teams traded leads back and forth throughout the last seven minutes of the game and, with a chance to win the game, Ryan Taylor missed a late three-point attempt as the game clock expired. 1. NU contained Jordan Poole after a hot start. It seemed early on that Jordan Poole was in for a big game. On the first two possessions of the game, Poole drove by Ryan Taylor for a layup and then Taylor fouled him on the three point line. The sophomore guard was 2-2 from the field and 4-4 from the charity stripe, scoring nine of the Wolverines first 15 points. But the Wildcats locked him up defensively, as he went 3-8 after the hot start and and finished with 15 points. 2. Dererk Pardon is as effective as anyone in the conference. When Vic Law struggled to score early, the Cats went to Pardon and he made the most of his opportunities. The undersized center went to work in the post against the Michigan big men, scoring 12 points in the first half after hitting a three pointer to begin the game. He finished the game with 20 points on 9-10 shooting. 3. Northwestern plays with a lot of fight. When NU went down by 15 early in the second half, it seemed like the Wolverines were going to run away with the game. That was until the Cats stepped up their defense and went on a 15-2 run over a five-minute stretch to cut the lead to 47-45. NU proved that they can compete with some of the best competition in the Big Ten. If they had started off the game better offensively, they would’ve had a better chance to pull of the upset.